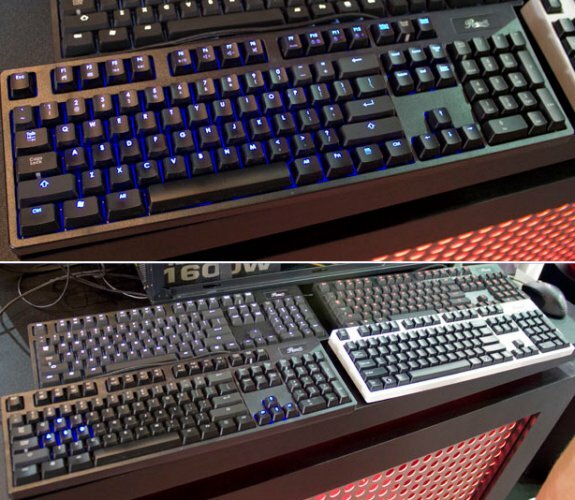 The Tech Report got to see some new mechanical keyboards from Rosewill at Computex. One of the most interesting ones is the RK-9100, a model with LED backlighting and some USB ports. All keys offer illumination, the brightness is adjustable and users can opt to only have the WASD and arrow keys lit. Rosewill revealed prototypes with white, red and blue backlights, but only the latter one is heading to production, with Cherry MX brown or blue switches. We saw prototypes with white, red, and blue backlights. Only the blue lighting is destined for production, and then only with Cherry MX brown or blue switches. Those are the most popular, Rosewill says. The RK-9100 line may be expanded to include red and black switches—and other backlight colors—after the initial versions arrive in August or September. The official list price for the RK-9100 is $140, but Rosewill tells us the keyboards will likely end up selling for less. Members of the RK-9000 series are regularly discounted on Newegg, and it seems RK-9100 models are destined for the same fate. Rosewill also has the RK-9000i, a white version of the keyboard without illumination. This model will be sold with Cherry MX blue and brown switches.